Tenali Rama (or Tenali RamaKrishna) is a well known character from India (especially in the southern India). He is known for his wit and wisdom. Various incidents of his intelligence are famous and popular in several folk stories. You can compare Tanali Rama tales with the wisdom tales of Akbar-Birbal. The good thing is the TV serial convey the message of having wit and wisdom in proper manner. It is good to watch for both kids and adults. And you can watch the TV Serial along with your family, which is a great factor in current days. 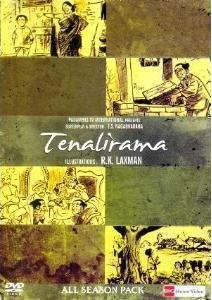 The TV Serial is based on the short stories about Tenali Rama written by Kamala Laxman. The titles present some illustrations by R. K. Laxman. Actually T. S. Nagabharana is the man behind the stuff. He wrote screenplay and even directed the TV serial. His aim of bringing the character of Tenali Rama to lime light pays off. L. Vydyanathan’s music works fantastically in background. Though the tile song is not effective. While watching the TV serial you will surely experience the technical limitations it is made with. Even the start and end titles are found shivering. In first episode you will find Master Kartik tries look convincing but he is failed at various places. The locales of a small village are explored pretty well. Dialogs are small and powerful. The lady playing mother of Tenali Rama is fantastic actor. See the last scene of the first episode and without speaking a word she is capable to convey the feelings of joy, blessings and possible good future of his only son; via her eyes. The camera movement for that scene are perfect. So there are technical limitations and some not so good act, but there are some good performances and good content at the end. It makes the TV serial a good watch. In first episode we see that Rama or Ramakrishna, the only child of his mother, is a very lazy and aimless boy. He is not interested in study. Actually he is not interested in anything. Even eating is considered as hard work by him and he like to sleep only. When his mother tries to wake him up, he is not interested in the same as well. In the night if he is sleeping under the sky and if rain comes, he will not make any effort to wake up and go inside the home to prevent himself from getting wet! Certainly his mother is worried for him a lot. In small village school where a teacher teaches under a tree to the students, he is considered as lazy person (of course). He never reach on time, and during study also, he draw the attention of even other students towards the mischievous stuff. One day something strange happened to him which changes his life forever!!! And we are presented with a totally new avatar of Tenali Rama. What was the stuff responsible to change his life? Well, it is good to explore on the screen. The DVD set is quite affordable we can say. With the MRP of INR 299.00 it is worth to go for. There are two DVDs in the pack. The DVD quality is quite good. Though, as mentioned earlier, the content found inside is not very good in technical aspects, due to technological limitations at the time of its original shooting. The TV serial is worth to have.